It’s not as prevalent as in Silicon Valley, but venture capitalists from China are increasingly looking to invest in New England companies. Several factors come into play locally: the presence of strong research universities, experienced technical talent, a vibrant community of startups, and often lower company valuations as compared to the West Coast. The recently added non-stop flights between Boston and Beijing and Boston and Shanghai (on Hainan Airlines) don’t hurt, either. One venture firm seems to be leading the way. Haiyin Capital, based in Beijing, has made investments in four Boston-area tech companies, totaling about $20 million, partner Xin Ma said. Those companies are flying-car developer Terrafugia; solar-cell firm 1366 Technologies; wireless power company WiTricity; and flexible electronics developer MC10. Ma calls these companies “the first wave” of local investments by his firm. An event on Oct. 7 at the Marriott hotel in Burlington, MA, brought together a mix of Chinese officials, business leaders, and Boston-area startups. Organized by Haiyin Capital, it was billed as the “U.S.-China High-Tech Summit, Boston 2015,” and it included delegations from the city of Guangzhou’s local government, Peking University, and Chinese energy and construction companies. The goal was to foster collaboration between Chinese businesses and Massachusetts startups. In addition to the Haiyin-funded startups, the Boston participants included Carmichael Roberts from North Bridge Venture Partners, Charles Hsu from EBO Global, John Werner from the MIT Media Lab, and Nam Pham from the state’s Executive Office of Housing and Economic Development. I spoke with Haiyin Capital’s Ma and founding partner Yuquan Wang (pictured above) about the firm’s strategy. They currently have a $50 million fund and are raising a new fund that they say will be bigger. They have been looking to invest in deals that are “usually equivalent to Series B, C, or D,” Ma said. Haiyin isn’t necessarily looking for startups that want to expand into the Chinese market. But the firm intends to help startups form partnerships overseas, when appropriate. For example, 1366 and Terrafugia are developing relationships with manufacturing partners in China. Haiyin and other Chinese VCs are investing in U.S. companies at a time when relations between the two countries have been strained by claims of industrial espionage, intellectual property theft (some apparently false), and cyber attacks. Asked about the current climate, Ma said there have been no issues with the U.S. government looking over Haiyin’s shoulder. “Our governments are fighting over power—let them. This is just business,” he said. Terrafugia’s co-founder, CEO, and chief technology officer, Carl Dietrich, said he sees China shifting more of its economic activity into high-tech and small companies. He added that in the past year he’s been encouraged by the public recognition given by Chinese officials to enforcing intellectual property protection. I asked Haiyin’s Wang for more specifics on what sectors he’s been looking at in Boston for future deals. He mentioned robotics (more industrial than consumer-focused) and biotech—specifically, gene-editing companies. The irony of venture capitalists coming from a communist country was not lost on Wang. In his public remarks, he said that multinational companies are a symbol of capitalism—and more specifically, capitalism being upended. 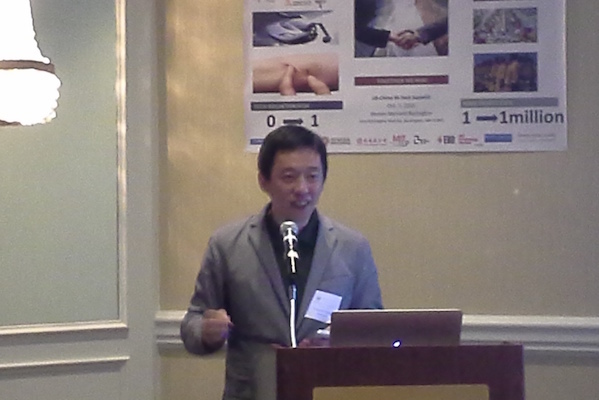 Economic development and startup summit in Burlington, MA, organized by Haiyin Capital.